Where is the Flower Gardens and how did it get its name? The flower gardens is 110 miles SE of Galveston Island and has an average depth of around 80 feet. It received its name after fishermen used the area for a fishing ground and looked at the bottom and remarked how much it looked like a flower garden with all the many beautiful corals. Divers began making this long trek out to the gardens in the late 1970, It takes around 7 hours to get their. My fist trip was on the Ms Rachael (a 50' Crew Boat). We left the docks in Freeport at midnight on Friday, made it to the gardens at 7:00 am and returned back to the docks at 11 or 12 on Saturday night. Visibility is around 80- 150 feet with temps in the high 80's during the summer and the 50's in the winter. There is a lot to see and you will get in around 8 dives over a weekend which is from Friday night to Sunday around 6:00 pm. Underlying salt domes forced the seafloor upward in various areas of the Gulf of Mexico, resulting in the formation of rises and banks. Conditions of the Gulf of Mexico were conducive to reef-building, which started roughly ten to fifteen thousand years ago. Two reefs, East Flower Garden Bank (EFGB) and West Flower Garden Bank (WFGB), made up Flower Garden Banks National Marine Sanctuary (FGBNMS) when it was initially created in 1992. In 1996, Stetson Bank was added to the sanctuary. The three banks are not contiguous. The sanctuary contains many aquatic species. Almost three hundred species of fish and over twenty species of coral are found in the sanctuary along with a wide variety of crustaceans, sponges, and plants. FGBNMS provides habitat for many protected and/or threatened species including marine mammals, sharks, rays, and sea turtles. Many fish species important to recreational and commercial fisheries inhabit the banks. NOS recently released a report detailing a comprehensive study of the fish communities and habitats of the Flower Garden Banks National Marine Sanctuary, located off the coasts of Texas and Louisiana. Researchers from the National Centers for Coastal Ocean Science and the Office of National Marine Sanctuaries determined that the Sanctuary is among the most healthy coral reef systems in the tropical western Atlantic. Large brain coral boulders like this one are not uncommon in the Flower Garden Banks National Marine Sanctuary. NOS scientists found that large apex predators such as grouper and snapper – which are virtually absent throughout the U.S. Caribbean - were commonly observed in the Sanctuary. They also found that there was a significantly higher overall number of fish in the Sanctuary compared to the U.S. Caribbean. The Flower Garden Banks National Marine Sanctuary supports a variety of species, including the Blue Angelfish. The scientists also developed a sampling protocol that will help managers better detect and track the influences of threats on the Sanctuary’s benthic habitats and fish communities. This information is especially critical for this region which is an area for so many competing human uses including oil and gas exploration, shipping, fishing, and even diving. By understanding where the plants and animals are and how their populations are changing, conservation goals can be better balanced with other human needs through a process known as marine spatial planning. The first recorded discovery of the areas comprising FGBNMS did not occur until 1936, when EFGB, WFGB, and Stetson Bank were included in a hydrographic survey of the Gulf of Mexico conducted by the U.S. Coast & Geodetic Survey. The survey provided valuable information about the geological and topographical characteristics of the banks. These initial surveys, along with additional surveys conducted in the 1950s, led researchers to conclude that the banks originated when salt domes forced overlaying sediments upward to form underwater mountains. Dr. Thomas Pulley, Director Emeritus of the Houston Museum of Natural Science, led a team of professional and volunteer amateur explorers to investigate EFGB and WFGB in the early 1960s. The presence of coral reefs off the Texas coast was still being debated at that time. Some researchers predicted the area would be too cold, or too turbid to support any extensive coral reef development. These scuba diving explorations, however, revealed that EFGB and WFGB did indeed support extensive, pristine coral reef systems. In the late 1960s, Robert Alderdice and James Covington established the Flower Gardens Ocean Research center (FGORC), heralding a period of intense interdisciplinary research which continues to this day. Results of this on-going research prompted U.S. government agencies to begin discussing the need to protect the banks from increasing human activities, including oil and gas extraction, anchoring on the reefs, and harvesting fish, corals and other invertebrates. With passage of the Marine Research and Sanctuaries Act in 1972, researchers began discussing the Flower Garden Banks as a candidate for designation as a National Marine Sanctuary. During the 1980s, recreational divers were also discovering the Flower Garden Banks. The Houston Underwater Club led a movement to have the banks officially designated as sanctuaries by submitting a formal letter of nomination in 1979. Due to a number of issues, eleven years passed before the Flower Garden Banks National Marine Sanctuary was officially established. President George H. W. Bush authorized Flower Garden Banks National Marine Sanctuary as the 10th National Marine Sanctuary on January 17, 1992. Stetson Bank was added to the sanctuary in 1996. Today, experienced divers can swim with whale sharks and mantas, get up close and personal with schools of hammerhead sharks and glide among coral heads the size of Volkswagen Beetles at any of the three banks. The best time to see the whale sharks and mantas is during the summer months, and hammerhead season is from February to April. At once beautiful and wild, the sanctuary is also known for a unique annual occurrence. Each August, about a week after the first full moon, divers can witness a coral spawning where billions of tiny coral polyps release eggs and sperm into the water in an event akin to an underwater fireworks display. And if you're lucky, whale sharks may show up to feed on the gametes. About a three- to eight-hour boat ride depending on your departure point: Three hours from Galveston, Texas, and roughly eight hours from Freeport, Texas. 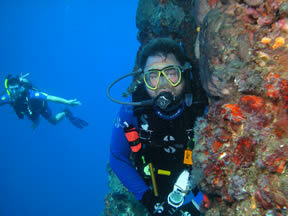 Gulf Diving, LLC operates two live-aboards out of Freeport ($440- $535 p.p. ), and Fish-N-Divers departs from Galveston at a cost of $500 p.p. Experience needed: Intermediate to advanced.